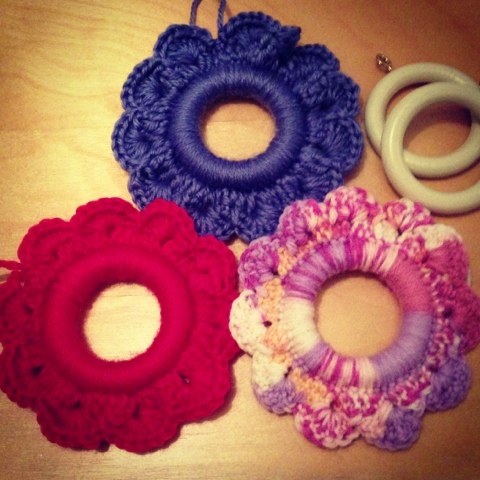 Camilla - Erika Campbell: Day 9 - Crochet Part 1 - Crochet a Curtain Ring! Day 9 - Crochet Part 1 - Crochet a Curtain Ring! If you have ever read any of my earlier posts you will have seen I've tried to attempt crochet before. I've always found it really tricky, I don't know why?! Maybe it is because I started with knitting so couldn't get over the concept of only using one hook instead of two needles?! Well I don't know what has happened but apparently I've got the hang of it! I've been dabbling in a few projects and here is one of them. These are quite simple to make and look really pretty! I'm starting to learn that even the most basic of crochet patterns look really effective! So far I've made 5 rings in a variety of colours. I plan to make quite a few and then hang them on a wall at different heights to create a focal point. Ill keep you in the loop when I complete this project! I've got some more crochet projects which ill show you over the next few days so keep your eyes peeled!